We all have our tried-and-true cake recipes — chocolate, marble, pound, and chiffon. But we like to expand our repertoire and try something new, one that we know will come out amazing. This cake is that plus. 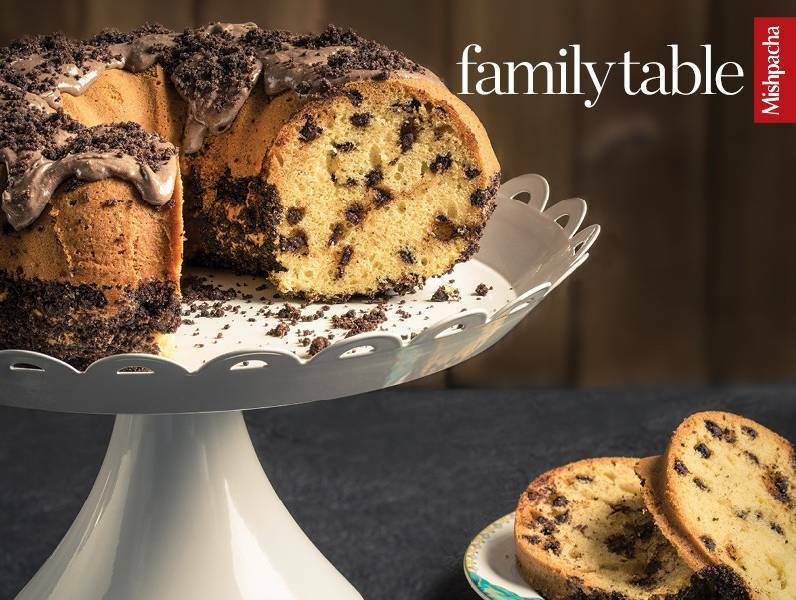 You have the option of dressing it up and making it a layer cake or making it a Bundt cake. Each component of it is so good — the cake itself, the crumbs, and the frosting. Enjoy them all! Make crumb mixture first. Mix ingredients together in a small bowl until crumbs form. Set aside. For batter, mix together flour, baking soda, baking powder, and salt in a medium-sized bowl. Place sugar, vanilla, eggs, and oil in the mixer and beat together on high speed for three minutes, until thick and lemony in color. Add dry ingredients alternately with soy milk. Mix well. Add chocolate chips last and mix well into batter. Pour batter evenly into two 9-inch greased and floured round pans. Spread crumbs on top of one layer only. Bake 30 minutes, or until cake tests done. Allow to cool. Meanwhile, prepare cream: Beat margarine, confectioners’ sugar, and vanilla at high speed. Lower speed and add cocoa and non-dairy whip. Continue beating for two to three minutes until fluffy. Spread cream on top of the layer without crumbs (I found it easier to do this after inverting the cake and smearing on the flat side). Place crumb layer on top of cream layer. Sprinkle top with confectioners’ sugar. Pour batter into a well-greased (especially on bottom of pan) and floured pan. Sprinkle crumbs on the top of the batter (this will be the bottom when you invert). In this version, I don’t use the cream at all. You can also bake the crumbs separately for 10 minutes, and then use some of the frosting as “glue” for the crumbs on top of the cake.